Sandy Voss isn’t a writer, but her work is a must read for homes in Glendale Heights, Glen Ellyn and other DuPage communities. The director of food and nutrition services for Marquardt School District 15 in Glendale Heights, who also directs the nutrition programs in Glen Ellyn District 41, Queen Bee District 16 and St. Matthew Parish School in Glendale Heights, got a call one day from a Realtor. Along with sending the lunch and breakfast menus home with nutritional information, she also posts the meal plans and nutritional information online. “I try to be as transparent with people as possible,” Voss said. Not only are parents trusting their children’s breakfast and lunch nutrition to Voss, children are gobbling up her work. Voss coordinates more than 4,000 lunches, 2,000 breakfasts and 200 after-school snacks daily for students in the three school districts and one private school. Voss assists a Marquardt Middle School student as he prepares chicken stir fry with broccoli for a Young Chefs Club dinner. Each young chef invited family members and a teacher of her or her choice to attend the event. 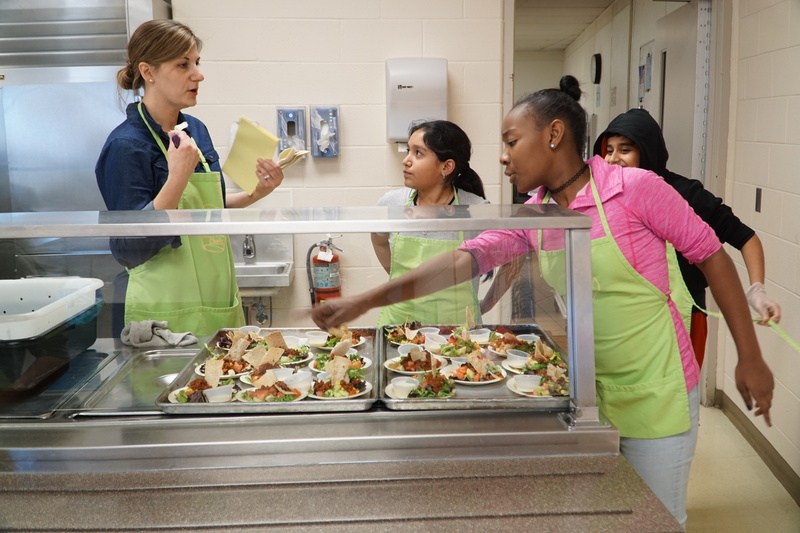 Her efforts in school nutrition and contributions to student health led the Illinois School Board of Education to name her the 2018 Illinois School Nutrition Champion. As a member of the Marquardt District’s Wellness Committee, Voss reviews programs and policies to encourage healthy lifestyles in students. She has pursued extra support and opportunities for students through the national Fuel Up to Play 60 program, a nutrition and physical activity program. Voss’ work does not end when school ends for the summer. She helps facilitate the Northern Illinois Food Bank Summer Backpack Program to feed local families during the summer months. 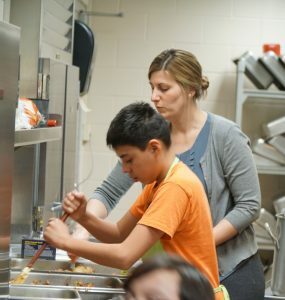 She noted that food quality and safety are her utmost concerns when creating meals for the students. Having a central kitchen and taking food out to locations puts some limitations on what Voss can offer for students’ dining pleasure. Facilities for student lunches weren’t even thought of when most of the schools Voss coordinates lunches for were built in the 1950s and ’60s. Voss assists first-grade students as they plant seeds in milk jugs. 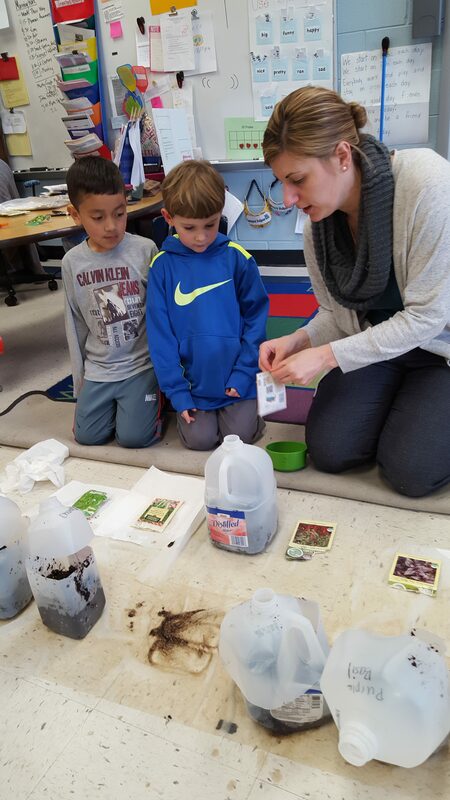 Students were learning how food grows and Voss was brought in as an expert. “It was a community where kids walked home because the homes were right there and there wasn’t even the thought of (meals as) a service that a school was required to provide,” Voss said. Voss said she makes sure that students getting free or reduced price lunches in the various districts are not treated any differently than pupils paying the regular fee. Voss has tried to be creative in getting food to students who may need more food than what the standard school meal offers. 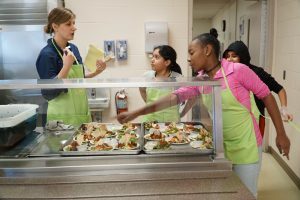 She noted because the same federal calorie guidelines are set for everyone in kindergarten through grade 5 (middle schools have separate guidelines), it can be difficult for a more active fifth-grader to feel full with the standard school meal. Voss earned her bachelor’s and master’s degrees in family and consumer science from Illinois State University and is a registered dietician and a credentialed school nutrition specialist. She also directs the Blessings in a Backpack program, which provides supplemental food for elementary students over weekends. Voss will receive her award at the School Nutrition Program’s Back to School Conference in August.